Learn with Colin about God, the King of All! 3...2...1...BLAST OFF! Come on an adventure with Colin to discover more about our great, great God. All the energy and fun of Colin's hit CD is captured on DVD as we race across space for the lost spotty message, dance with a gorilla band in the jungle, boldly wrestle an inflatable crocodile and meet some of Colin's fairytale friends. With a heart for teaching Bible truths, a whole gang of special guests and a couple of trademark memory verses thrown in for good measure, 10,9,8...God is Great is sure to have thw whole family singing and dancing along as they learn with Colin about God, the King of All! 10, 9, 8.... is a fantastic DVD for young children. My young son loves the songs and i love that the content is so encouraging and biblically based. It was bought for him by two of his God parents, both young people who remember the DVD fondly themselves! I would highly recommend this for anyone with toddlers. A fabulous and fun dvd that appeals to young children. They have such fun watching and joining in with the songs while learning about the important issues of God, Jesus and the Bible. At first glance to a 40 year old, I thought this DVD might not rate so well compared with the high production quality of secular DVD's. But to a 4 year old who loves singing and dancing this is fantastic. She has repeatedly thanked me for buying this DVD, and continues reciting its sound theology throughout the week. Biblical truths set to music make them so easy to remember and Colin Buchanan makes it fun. This DVD has conveyed far more than I could have articulated. My wee boy LOVES this DVD. It's a great fun DVD with catchy songs and lots of action while teaching important bible truths. I would hightly reccommend it. 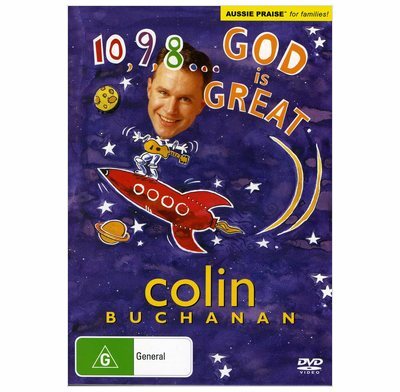 This was our second Colin Buchanan purchase (after 'Remember the Lord'), and our son loves it. It's aimed at slightly older children than the first one we bought, and while Colin's bizarre sense of humour might not appeal to everyone, it certainly appeals to our son. Highpoints in our family: the title song and 'People change but God don't change at all'. This DVD came highly recommended by good friends and we have enjoyed it. Some parts are a bit odd- Colin dressed as a baby for example- but the way it helps all memebers of the family learn Bible verses is brilliant. It has much more substance than many children's DVDs! We have owned this for DVD for over five years, but didn't play it very often for the first few years. For some reason, we just couldn't get into it to start with. However, once we played it more frequently, the songs 'grew' on us, and we now consider it a favourite. The songs have depth, but they are fun to listen to and easily enjoyed by the whole family.